Catholic leaders are condemning President Donald J. Trump’s request for National Guard troops to be deployed to the U.S.-Mexico border, calling it dangerous and unwise policy and urging the administration to be more welcoming to migrants trying to enter the United States. Asserting the situation had reached “a point of crisis,” the president signed a proclamation directing the deployment of the National Guard to the border to fight illegal immigration and drug smuggling. “And we know we must end the hopelessness in our communities that fuels our nation’s addiction to drugs, which deals only death and destruction to the people of our continent,” he said. Other bishops also weighed in, some taking to social media to express displeasure at the administration's policy. There is no ‘invasion’ of Central Americans heading to the U.S.
Bishop Daniel E. Flores of the Diocese of Brownsville, Tex., published a tweet on Wednesday that sought to debunk notions of an “invasion” of Central American migrants making their way through Mexico to the United States. Over the past few weeks, a large number of migrants from Central America—a group that reached upwards of 1,500 at its height—had made their way through Mexico, seeking relief from violence plaguing their home countries. Mr. Trump has taken aim at the group and praised Mexico for breaking up the caravan. 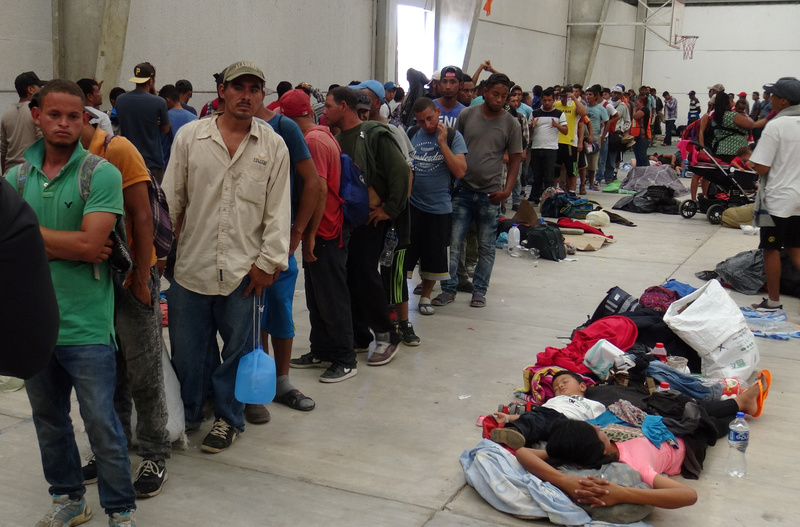 Many people in the caravan have been given temporary transit visas, which they intend to use to request asylum in the United States. Others say they plan to ask for humanitarian visas to stay in Mexico. Bishop Flores wrote in his tweet that the migrants had a right to seek asylum. “There is no ‘invasion’ of Central Americans heading to the US,” Bishop Flores wrote. “Central Americans have a right in US law to apply for asylum,” he concluded. These measures manifest a very clear message: we don’t care about anybody else. Mr. Trump’s decision to use National Guard troops at the border is not without precedent. Homeland Security Secretary Kirstjen Nielsen said the effort would be similar to a 2006 operation in which President George W. Bush deployed troops to help U.S. Customs and Border Protection personnel with non-law enforcement duties while additional border agents were hired and trained. President Barack Obama also sent about 1,200 troops in 2010 to beef up efforts against drug smuggling and illegal immigration. One congressional aide told the Associated Press that lawmakers anticipate 300 to 1,200 troops will be deployed and that the cost was expected to be at least $60 million to $120 million a year. The Pentagon would probably need authorization from Congress for any funding beyond a few months, said the aide, who was not authorized to speak publicly and spoke on condition of anonymity. [Sign up for Convivir, a new newsletter from America Media. Catholic leaders get on the right side of the argument. The United States needs workers and legal immigration could bring millions in from Latin America legally but the Catholic Church opposes it. The Trump economy is currently leading to massive worker shortages. But instead of celebrating it the Church leaders condemn Trump and hurt the poor. How typical of liberal actions and policies. Should Catholic leaders look at themselves as the villains in this? Isn't it a little ironic? After all the migrants are escaping countries which are heavily Catholic. Why should anyone listen to Catholic leaders on economics, social policy or defense of our laws? They are passing through other countries that are closer to their home and are more similar culturally so that is where they should want to settle. Mexico is a large area and should be able to absorb them. From what I understand many are staying there. When Catholic leaders discuss seriously why these countries are so poor, they might be listened to. But they will not because they cannot admit that Western Europe and the United States have a superior economic system flowing from a drfferent culture. A thought for the bishops near the Mexican border. Recommend that all recent arrivals from Latin America abandon their old culture and assimilate into the US culture which has made the United States so profitable. The sooner they do so the more likely their children and grandchildren will prosper. With respect, I have mixed feelings about your comments. I agree that our nation and many in Western Europe have a superior economic system, however our manufacturing base has steadily eroded in our nation for many years. Also, I believe that more than a few Latin American nations in years past were ruled by dictators either of the political right or left (ultimately, I believe either type of authoritarian regime is wrong and harmful) so our nation as well as the former colonial powers of Europe must bear some responsibility for the lack of economic opportunities in many Latin American countries. Finally, while I agree that assimilation into our culture is beneficial, our culture is diverse, and as time goes on, the proportion of our population which is white (as I am) will decline. I don't believe that people from other nations must fully abandon their cultures; I believe that we can all learn from the good in each culture. Thank you for your comments. I will try to answer most of what you say and hopefully it will make my point of view more clear. Essentially I agree except to characterize a dictatorship as of the right or left has no meaning. They are all authoritarian and as such statist political systems or systems of the left. There are essentially few governments of the right any more. There are some family dynasties in the Mid East and a few other places in the world. What contrasts to these statist political systems are freely elected governments which most will call democracies. But even in democracies, there is a wide range of governments and few are really free. The United States is getting less free over the years as the government gets bigger and regulates what you can do. In stead of the dictator or king telling you what you can and cannot do, a dense bureaucracy makes the rules. This is one of main reasons for Brexit and Trump. To be free of regulations that stymie initiative. Starting a new business is getting harder and harder and I once heard that in a typical Latin American country it takes over a year and 3 times the cost is does in the United States. But it was getting harder here too. No. Just Spain in all of Latin America except Portugal in Brazil. In 1500 the pope divided up the world into Spain and Portugal. We only think of Spain in Latin America but it you go east from there all the colonies were Portuguese until you get to the Philippines which was in the Spanish half of the world. There is a plaza in Lisbon that has a map of the Portuguese world. England, France and Holland had almost nothing to do with Latin America. So there is no responsibility for what happened there by those who settled the United States and Canada. If you want to understand the root of the dysfunction in Latin America and the success of the US and Canada, read Niall Ferguson's book Civilization. He explains how a small area of the world (essentially Great Brittain and Holland) came to dominate the economic activity of the world by a culture of freedom and laws protecting that freedom. Deidre Mccloskey also has written about the success of this small area around the North Sea and how their ideology permeated the West and made it so successful.. Her thesis points to the power of the individual to do well and be recognized and be rewarded. Latin America had a culture which flowed from Spain and which stifled freedom. I doubt that you would get many takers that we owe Latin America because of the tyranny of Spanish culture. Success has nothing to do with Europe or white people. It has to do with following the culture of freedom which allows its people to thrive and innovate. A little over 200 years ago the people of Scandinavia were extremely poor and supplemented their diets with bark from trees. This culture of freedom and innovation spread first to the rest of Europe and then to several parts of Eastern Asia such as Hong Kong, Singapore, Taiwan, Japan and South Korea. The Japanese went so far as to copy everything the United States and British Empire did to even the clothes they wore. As things from other cultures were found to be useful, they were assimilated into the West. But mainly it is freedom and recognition that has led to success. These ideas know no color or place in the world. The whole idea of "white privilege" or "white supremacy" is a joke as the British did more than any nation of the world to set people free. In the United States, one of the most successful if not the most successful sub group are Asian Americans. They brought a culture of hard work with them and have developed a love of education both of which thrive in a world that emphasizes freedom. I don't believe that people from other nations must fully abandon their cultures; I believe that we can all learn from the good in each culture. People never fully abandon their cultures but have to recognize that to be successful they must assimilate or else you end up with a ghettoized society of poor performing sub-groups.. Given all that - do I believe that our culture is the best it could be. No, I believe there are a lot of things wrong but haven't seen what other cultures have to offer that would cure what is wrong with our way of life. More importantly, I see a drifting away from the culture that made the United States so successful but as I just said nothing coming from any other part of the world would correct this. Was there a protest when Obama requested $500M for his 1,200 NG Troops? Or, do these select Bishops (and Jesuit America) just want to virtue signal their displeasure at the Trump administration? Bishop Seitz says the borders have never been more secure. So, there should be nothing to worry about. Surely, the good bishop could ask his brother bishops in Tapachula, Chiapas, Mexico to open their doors to the Hondurans, rather than force them to walk another 2,000 miles? How many will die or get sick on such a long trip? Or, maybe, the Mexican bishops have a NIMBY position. Bigger question, for Pope Francis. Why not call for Mexico to accept these migrants? After all, they speak the same language and can assimilate faster. Even bigger question. Why can't Catholic communities keep their people? I agree that our nation can't accept an unlimited number of immigrants. However, with the exception of Native Americans, we are all descendants of immigrants . I agree with the bishops who have spoken for a welcoming attitude towards immigrants, particularly women, children, and the elderly. Pope Francis has wisely said that we shouldn't have a "throwaway culture," and some very elderly people may be so disabled either physically or emotionally that they can't contribute to our nation. However, I believe as a retired Special Education teacher of brain damaged children that all human beings are made in the image and likeness of God. I believe it is truly pro-life to treat everyone equally, regardless of their circumstances, both before as well as after birth. As a former long-time Democrat who now is a moderate Republican , I believe that while we.must defend our nation against those who may threaten us, that Jesus, as the Prince of Peace, would prefer that our nation not expend huge sums of money on our military. Instead, I favor foreign aid to those poverty-stricken nations for economic development, as well as humanitarian assistance for those vulnerable people in need. Finally, I have personal experience with immigrants. When I worked in a group home with disabled men years ago, many of the staff in our agency's residential department were from Liberia, and had fled from a brutal civil war to seek a better life in our nation. It's irresponsible for Catholic leaders to express their opinion on how best to resolve what is essentially a matter of politics and economics. They should, by all means, express their concerns for those who are poor and oppressed, and leave the solutions to those in power who were hired to protect the nation. If it is possible to protect the country and at the same time provide refuge for those outside of the country, then the Catholic leaders' voices will be there to remind the government officials of their concerns for those poeple. With all due respect, Catholic leaders don't have any knowledge that makes their opinion about how to handle immigration have any value. Expressing their ignorant opinions on politics and economics, given their influence over the opinions of those in their religion, is poor judgment. Stick to saving souls and let those in charge of the nation do their job. "Be nice" is not the solution to worldly issues. All issues in life are ethical and spiritual issues. Thus, the bishops would be completely irresponsible to not speak out on the issue of immigration. Especially when, even here in a Catholic/Christian journal, the "debate" devolves into veiled bigotry, at best, and overt bigotry, at worst. Good for Catholic leaders for reminding people to check their hearts and find a Christian response to everything in life. That is, after all, their job. Do you know how many guns and assault weapons and illegal drugs are smuggled into the US over the Mexican border? Neither do the priests. This is one example of many that the priests have no clue about but are yammering about troops on the border. How many people can our country support and how many spots for legitimate refugees are taken by those who are coming here to distribute drugs to our youth? How much harm to the current citizenry of the US will continue to occur as criminals cross the border illegally? What data do the priests use to make that assessment such that they think that all Catholics should adopt their opinions? If the priests want the government to preach about doing "something" or "more" for the refugees, that's fine, that's their job. Let Caesar handle Caesar's job. The U.S. and other European countries do not have the "moral" responsibility to correct the ills of other countries and allow an unlimited number of people to enter the U.S. from other countries that have irresponsible social and political policies or from every country that is torn apart by war and poverty. > Provide a pathway to citizenship to the 11 million illegal immigrants that currently reside in the U.S.
What the bishops are doing is turning a blind eye to the real issues that must be adequately addressed. Here is a news flash for the bishops: President Trump has the responsibility to enforce our immigration laws and protect our citizens. Congress has the responsibility to resolve our immigration problem legislatively, and the bishops have the responsibility to stop pointing fingers in one direction.